Oh, the holidays. I can’t help but love all of the wonder and joy they bring—even if, as a mom to 3-year-old twins, I’m now the one responsible for creating said wonder and joy. The holiday card is no exception. It becomes a bigger production every year, and while I’m not one to worry about “the perfect photo,” I always hope for a nice family memory. But how am I supposed to style a photoshoot when getting us all dressed on an average day is enough to break me out in a sweat? Enter: my Trunk Club stylist. 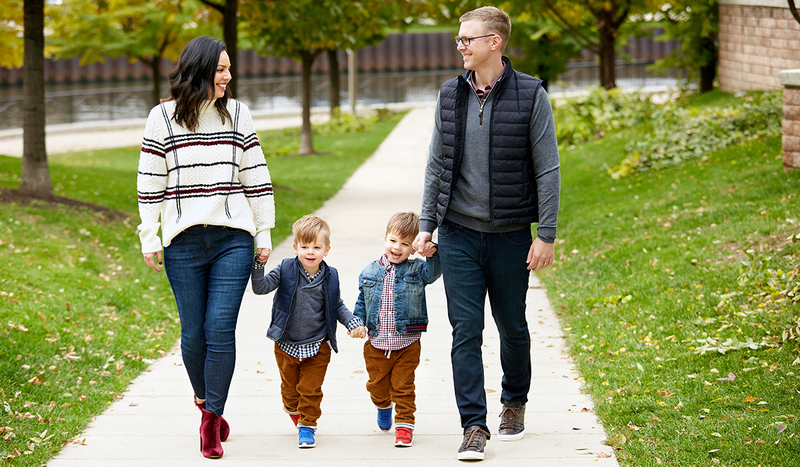 I’m an editor here, and I’ve followed fashion all of my adult life… but if you tell me that someone else can take on the craziness of styling my family, I’m going to jump on it. Turns out, handing this job over to an expert not only made us more photogenic, it actually made the photoshoot fun. (Yes, parents, I said “photoshoot” and “fun” in the same sentence!) I can thank our stylist Lindsay for that. 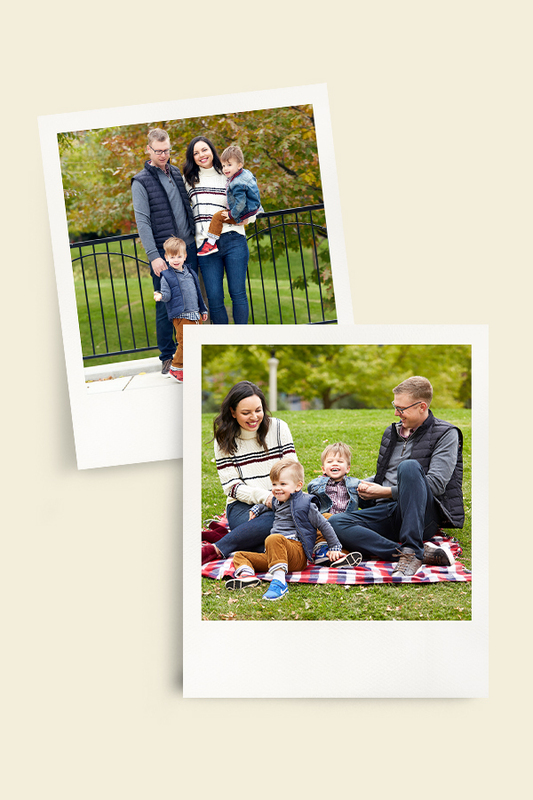 She’s married to a firefighter and has a 2-year-old at home, so she’s more than equipped to handle a family photo. After getting to know each other a bit, Lindsay asked a simple question: “How would you describe your style?” It’s something all of our stylists ask, because personal style is all about you. Or in this case, me. Lindsay listened and nodded along as I rambled on about how I “wear a lot of neutrals, but really find myself drawn to color,” and other nonsense. I sent her a Pinterest board with a handful of outfits, and after assuring me that she understood my style, she started pulling some pieces. She had great ideas, and even found a few things my husband and I normally wouldn’t have picked for ourselves (an expertly tailored Veronica Beard blazer for me, a pair of slim-fit twill pants for him) before we landed on the outfits you see here. Lindsay stuck to two main hues: navy and burgundy. But as you can see, we also incorporated neutrals like ivory, brown, and grey. Neutrals are like a Mean Girls math equation: The limit does not exist, so use them! Next up, pattern. It seems that somewhere along the line, we were all advised to stick to solid colors in family photos. And while five competing patterns in one photo would be overkill, a singular color doesn’t offer much. Well-placed prints add just the right dose: We had plaid, checks, and even a striped detail on the twins’ pant hems in our photo. None were overbearing, and all follow the color palette. The last element Lindsay wanted to include was texture. Chunky knits, suede, corduroy, quilting—it’s all in there. Doesn’t it make you want to snuggle up on a plaid blanket and watch the leaves turn with us? Sigh. The pieces of my outfit—sweater, jeans, booties—are everything I normally wear and find comfortable, but elevated to a level that felt special. Lindsay loved this gorgeous turtleneck, with its oversized plaid motif, and how the color popped against the other outfits. And the casual front tuck (or French tuck, as it’s sometimes called) gave shape to the oversized top. We also had a gorgeous pair of burgundy suede boots that needed to be seen. I normally live in flats, but I’ve seen enough photographic evidence to know that a heel looks good on camera. It doesn’t have to be high, and it certainly doesn’t need to be hard to walk in, but that slight elevation made a big difference. While my look was all about pattern and color, my husband’s was a great example of how layering makes an outfit. 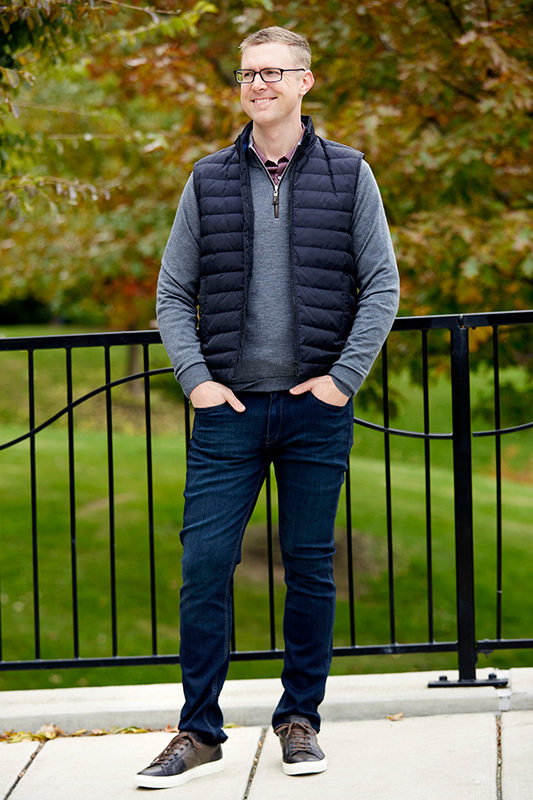 He could wear this burgundy button-down and half-zip sweater to any holiday event, or even the office—exactly the kind of dual-purpose our stylist had in mind. Trunk Club isn’t available for kids, so Lindsay helped us find outfits from our parent company, Nordstrom. 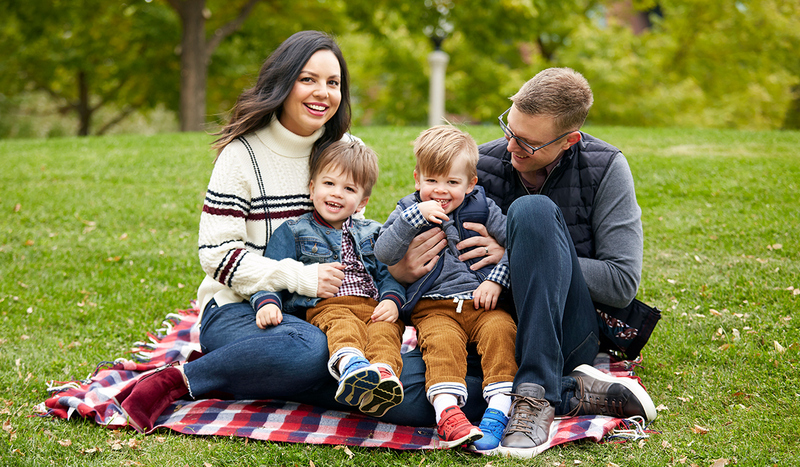 I love dressing our boys in outfits that coordinate without being matchy-matchy, and these layered looks did just that. They were so cute, and still comfortable enough to move in and play (and boy, did they play). Of course, perfect outfits can’t magically make your kids behave. But with a little motivation from a bag of jelly beans, the twins were meltdown-free during the shoot. The only hitch? Instead of the cute Chelsea boots we picked out, the boys insisted on their signature “one red, one blue” sneaker style. It may not be picture-perfect, but I’m glad—this photo captured their own personal twin moment in time.